According to retirement expert Donna McCaw, successful retirees approach their retirement the way an experienced outdoors person approaches a canoe trip, by over-preparing and then going with the flow. Like a canoe trip, retirement can be both safe and exciting, and retirement expert Donna McCaw shows readers how in this practical and entertaining book, now fully revised and updated. It’s Your Time focuses on retirement advice for Canadians, but its principles are applicable to retirees anywhere. McCaw shows how you can plan the retirement that fits you — how you can enter this fulfilling time of your life with confidence and flexibility, prepared for some pleasant surprises. 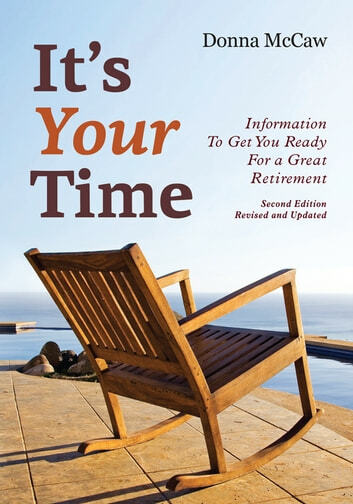 The author concludes her one-stop guide with a section of resources to help you plan for what is truly your time, your retirement years. Donna McCaw (B.A., M.Ed.) retired at age fifty-four after a career in education and counseling at high schools and colleges and with Adult Education programs. She is a speaker and workshop presenter on Retirement Readiness, Retirement Planning for Women, and other topics. Her writing and presentations are straightforward, down to earth, and accessible as well as spirited and fun. Donna lives in Elora, Ontario. How to Care for Your Aging Parent... & Still Have a Life! Sell My Stocks Before the Baby Boomers Crash the Market? Aging With Health - The Secrets To Healthy Aging And Making The Best Of Your Golden Years.